BANANA fan? It turns out you might have been peeling them wrong for years. Despite millions of years of evolution, many humans still haven’t cracked the best way of eating the yellow fruit and have been doing it upside down. While most people peel their bananas from the stem down, we should copy monkeys in splitting from the base. Doing it from the non-stem end means the banana skin splits easily into two pieces, which helps to make it bruise-free. The best part of the monkey method is that it means you can hold the firm stem as a handle – nature’s answer to a lollipop stick. The mind-blowing revelation was demonstrated by YouTube user Crazy Bananas, an anonymous man wearing banana underwear who shared the benefits of the life hack. This is sure to be a game-changer for those who find it tricky to peel from the stem and who create a squishy mess as a result. Over 100 billion bananas are eaten worldwide annually, and it leaves you wondering how we’ve been doing it wrong for years. The YouTuber captioned the video: “I'm posting this video in the hopes that it will help other people discover the joys of peeling a banana. “I had never known about this method before a friend showed me.” And many people were quick to comment about how shocked they were at the discovery. An interesting story with a moral! instead of staying with the hot tempered Kowravas. Vidhura was so overwhelmed with the joy of the proximity of Krishna that he did not realise that he was offering the peels of the bananas to Krishna - while throwing away the real fruits! What did Krishna do? He ate the peels with a great joy! ( and make the others feel) while we eat it. For the sake of myth, it is ok. In real life, it may be looked upon differently. We know "gods" do not eat, so we offer sweets to them and then enjoy in eating it ourself. If "gods" started eating the sweets no one will offer it. Krishna is a Mayakari, does a mear mortal understand what He does? I have seen the stage magicians do even more unbelievable tricks. This is no disrespect to the sentiments of the believers, it is just my opinion. surely I will eat the peels happily! People swallow flame, walk on burning live coals, pierce their body umpteen places with spears, hooks and needles, thrash themselves with whips and get crucified willingly. Pain originates within the body and is difficult to be measured objectively. Pain perception is highly subjective. It is a matter of one’s mind. Cultural factors, personality and mental attitudes influence the sensation of pain. Extroverts report more pain than introverts. Whether or not we feel the pain is determined by more than the nature and intensity of the external stimulus. Women seem to bear the pain better than their male counterparts. 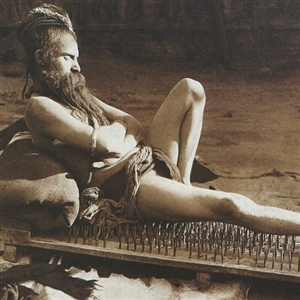 The feat performed by the Indian fakirs by sleeping on a bed of nails would be unthinkable–even in the wildest dreams of the westerners. That the pain can be controlled by thought alone has led to the new theory of pain perception, called The Pain Gate Theory. In order to feel a pain, the pain signal must be strong enough to force its way through the pain gate–a real anatomical structure in the spinal cord. This pain gate protects us from trivial pains and aches. Cortex which produces endorphins, the natural pain killers in the brain, feeds this gate. Its release can effectively close the pain gate and decrease the level of the pain experienced. Nerve fibers with small diameter carry the pain stimuli through the pain gate. Nerve fibers with larger diameter passing through the same gate can inhibit those pain signals carried by the smaller ones. Chemical released in response to the pain stimuli also influences whether the gate is open or shut to the pain signals. The pain gate can be shut, by stimulating the nerves carrying the touch signals, through massage techniques, rubbing, application of ice packs etc. Acupuncture stimulates the release of natural opioids, chemicals inhibiting the transmission of pain signals. So to say, “We can fight one pain with another pain”. I have been eating bananas in the monkey way, for the past few years!! I was waiting for this thread to receive the coveted 5 * s! How can we ignore our revered ancestors without honoring them! In every house there would be at least one banana lover! I have been happily eating the peels (at the inner side) ever since the time when I read that it contains a lot of vital nutrients. In Costa Rica, we went to see a Banana Plantation. I was shocked to see them wasting all the stems and leaves. They compost after harvesting the banana, I wished someone to salvage the stem, flower, and leaves. That is the way I learned, I always wondered why Americans opened it the other way.